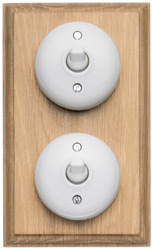 These reproduction Bakelite Dolly switches on classic oak pattresses provide authentic styling whilst meeting modern safety standards. Inspired & modelled on 1920s era fittings. 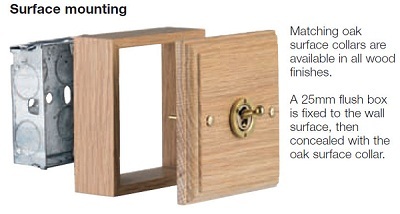 The hardwood finishes available are shown below; please specify finish(es) when ordering. 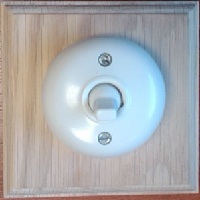 The Bakelite switch is available on either a black or white base body (ie the part behind the dome & in front of the wood. Please specify. 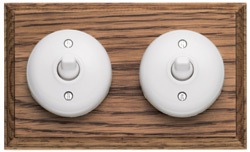 There are matching electric sockets shown on the sockets page. We generally don't supply just 1 or 2 switches, it isn't worth the paperwork. But we are happy to discuss or specify for a larger job. 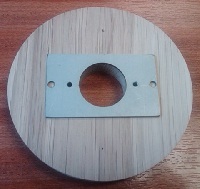 Please contact us to discuss your requirements & for quotes. Before contacting us for a quote speak to your electrical installer about your exact requirements. Do you need an adapter kit for my Bakelite switch ? Will I need an adapter kit for my Bakelite switch? It really depends on how or what you are fitting them to. 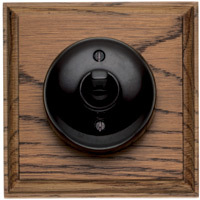 You need an adapter kit if you are fitting a Bakelite switch onto an existing wall box (with oak pattress). 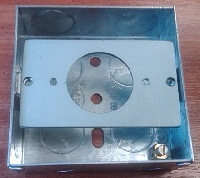 The adapter fits to the wall box (as shown below) and the pattress is fitted to the adapter by using the long screws through the pattress from the Bakelite switch. 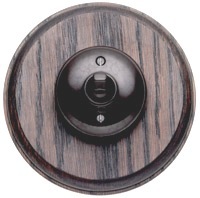 Bakelite adaptor kit for mounting to single wall box. Ref: BAK. Bakelite adaptor kit for mounting to double wall box. Ref: 2BAK.